“A rose is a rose is a rose”. This famous line is said to refer to the fact that things are as they are. The rose is also a symbol of love (just think of the inflated prices circa February 14th) and even victory. The Kentucky Derby (aka Run for Roses), for example, drapes a garland of the red flowers over the winning horse. Rose City Kitchen is the newest addition to the bouquet of eateries which Rose and Sons, Rosewater and the Rosedale diner. These restaurants are not related in any other way but the origin of their names are more obvious than this one. Rose City is a small town in Michigan (pop. 653) Given the middle eastern influence of RCK and the fact that Rose City, MI is 97% Caucasian, I quickly eliminated that connection. Portland, Oregon is nicknamed the Rose City. I figured there might have been a connection given the snacky, trendy nature of the place, but I quickly figured that was a stretch. A little more digging (well, I just read their about page) led me to the Jordanian town of Petra, a historical city known for the rose-coloured stone in which it is carved (this would likely explain other middle-eastern bakeries in Ontario with the same name). The concept of Rose City Kitchen is brilliant. It takes the bold flavours of the middle east and serves them street style in handheld pitas that resemble tacos in both size and price. Representation includes Egyptian, Moroccan, Lebanese, Greek and the RCK original. The promise is that each is stuffed with ingredients (eg. couscous, dates, apricots, almonds and haloumi cheese) respective of their homeland. After a period of indecisiveness I ordered the original with a chicken and a kale salad to go. I watched as a pita was warmed in the oven in front of me and I anticipated the bold flavors that would fill the awaiting pocket. I received the sandwiches and took a few bites. I waited for a climax that never came. The promised flavours were absolutely void. Minuscule, overcooked pieces of chicken were hidden among a garden of lettuce and carrot. The home fries were few and far between. The promised flavour from the humus and garlic oil were underwhelming and the harissa dressing seemed an afterthought which added sub par heat and flavour to the sandwich. 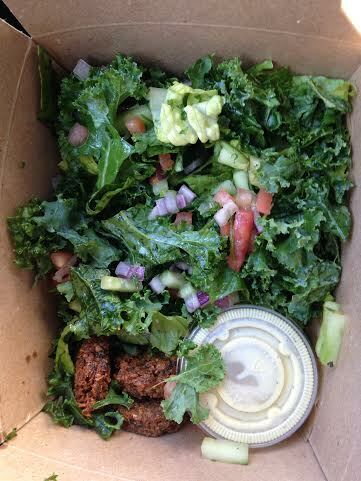 The kale salad with falafel ($7) offered a little redemption. 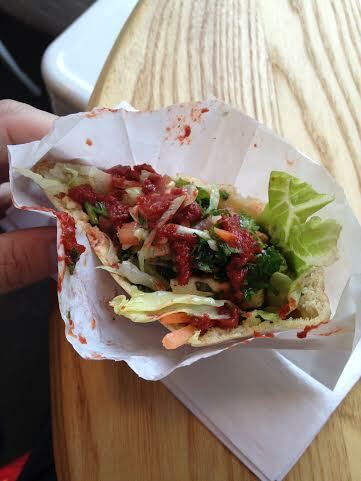 Three pucks of falafel were hidden among the jungle of crisp and fresh greens. The addition of the tomato and onion broke the monotony a bit and the tangy dressing was a nice blast of flavour. Rose City Kitchen has emerged in a crowded street food market offering something unique; a snack sized pita stuffed with bold Mediterranean flavours and priced under 5 bucks. I try to give the benefit of the doubt and look at new restaurants through rose-coloured glasses except the above claim is as deceitful as Pete Rose himself. The flavours fell well short of expectations. I’d much rather grab a messy taco for the same price or a sloppy shawarma for a buck more. The kale salad was fresh and well dressed but the three average tasting falafel disks were barely more than garnish. The concept of RCK sounds as melodic as Joni Mitchell’s “For the Roses”. The kale salad reminds me of Guns N’ Roses “Welcome to the Jungle”. In the end, I’m left humming Poison’s “Every Rose has It’s Thorn”…..with the thorn being execution. I guess Gertrude was wrong.